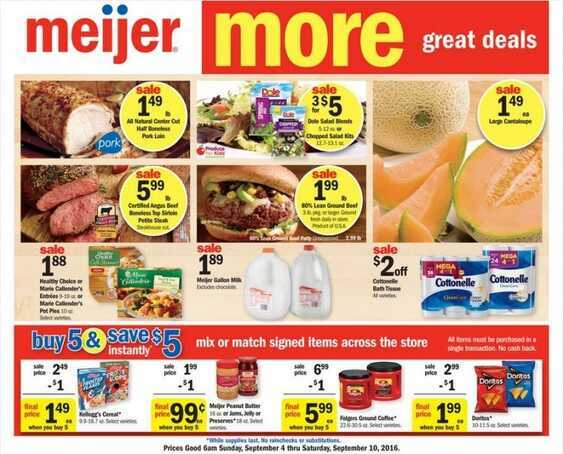 Meijer Ads Cincinnati this Sunday 4-9-2016 presents: all natural center cut half boneless pork loin, dole salad blends, chopped salad kits, 80% lean ground beef, certified angus beef boneless top sirloin petite steak, healthy choice or marie callenders entrees or maria callenders pot pies, meijer gallon milk, kelloggs cereal, peanut butter or jams jelly or preserves, folgers ground coffee, doritos, cottonelle bath tissue, large cantaloupe, coca cola products, aquafina, little debble big packs, nabisco multi pack, gogo squeez, eckrich meat franks bologna or cotto salami, digiomo pizza, meijer syrup, 7up products, nabisco family size wheat thins or family size triscuit, nature vally bars or fiber one bars, red green or black seedless grapes, pero mini sweet peppers, campari tomatoes, taylor farms organic salad, pears, locally grown round white potatoes, true goodness organic whole white or mini bella mushrooms, cucumbers or green onions, strawberries, strawberry or vanilla berry yogurt parfait, true goodness pocans. Also you get at Meijer Supermarket: all natural whole chicken, all natural boneless whole pork tenderloin, all natural boneless skinless chicken breasts, certified angus beef T-bone or porterhouse steak, natural split chicken breasts, italian sausage links and ground turkey, sockeye salmon fillet, tilapia fillets, lobster tail. See more by visit the site: Supermarket Weekly Ads.